Hydroponics and hydroponic lighting naturally tie together. And, that’s best done as a hydro grow kit with light movers. A hydro grow kit with light movers can be an indoor grow system with passive hydroponics or active hydroponics. Either way, the indoor grow system hydroponic lighting can be moved with a grow light mover. So, that’s all part of the indoor grow setup. 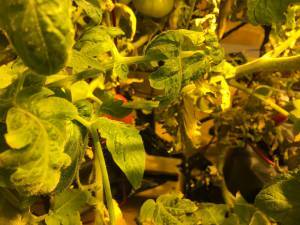 The photo above shows a passive hydroponic system with an inverted water source and indoor plant lights above. And, that water source simply feeds in as the water level drops in this hydro grow. It’s a simple indoor grow setup that works really well for smaller plants and fast to harvest plants. So, this hydroponic indoor growing system just needs an occasional top off along with mild nutrient. Now, as we look at that photo of the passive hydroponic indoor growing kit, look beyond. We can just see a bit of the larger, active hydroponic setup behind it. This hydro grow kit has LightRail light movers shining evenly on all the leaves. And, that’s part of the larger active hydroponic indoor grow setup with a real reservoir and pump. So, in the background and as part of the active hydroponics, we have the hydro grow kit with light movers for the indoor plant lights. The photo to the lower right shows one example of the hydroponic reservoirs available. And, that’s for the active hydroponic grow systems. Here is an active hydroponic system with the water reservoir under the plants. This indoor grow setup is Botany Unlimited’s HyGrowCage. This hydro grow kit with LightRail light movers needs the light loving plants to be in with the active hydroponic system. And, the reason for that indoor growing system placement is because light loving plants grow bigger and take in more water. So in that hydro grow, the larger, hydroponic water reservoir suits these plants best in this indoor grow setup. But, that’s not the only reason the light loving plants go with the active hydroponic system and under the indoor plant light. The indoor grow system with hydroponic lighting requires that these plants be positioned close to that grow lamp. In other words, these plants need to be the very ones positioned as close to the indoor plant light on the grow light mover as they can. So for these grow lights for indoor plants, they are positioned closer and are moving along the light mover rail. Whereas, the plants that don’t need as much indoor plant light won’t need that direct grow lamp positioning. But, they still benefit from that same hydroponic lighting movement even though they are positioned slightly offside. This photo is looking 3′ under a very dense canopy. 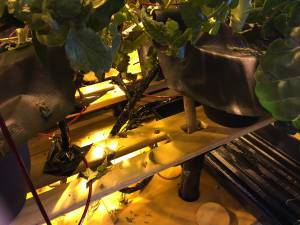 We can see all the leaves are interacting with the grow lamp when that grow lamp is moved on a LightRail light mover. A grow light mover is the best way to duplicate nature. Plants that work well with an active hydroponic indoor growing system include the following. They are tomatoes, peppers, zucchini squash, broccoli and any of the larger crops. Again, they require good indoor plant light. And, having the grow lamp move on a LightRail light mover is the best way to get the grow light system maximized. This is the case for a LightRail 3.5 Kit, a LightRail 4.0 Kit or a LightRail 4.20 Kit. For them, the best indoor grow lights move. How this works is the grow light system can be positioned closer without the damaging hot spots. On the flip side, it’s the hydroponic lighting variable that is best to get rid of any shadow patterns. So, what we have left in our grow light system is a closer, more effective grow lamp. And, that grow lamp is interacting with more of the leaves of our hydro grow. Take a look at the photo to the left. It shows that light penetration to all the leaves. And, this photo is about 3’ under a very dense canopy. So, the indoor grow system that includes a grow light mover gets that better quality of light to those leaves. And, that better indoor grow light of our hydroponic lighting is now at just the right amount of time per leaf area. So, the indoor growing system that is closest to duplicating the sun has the indoor grow light moving on a LightRail light mover. It’s an indoor growing kit hack that makes a world of difference. And, that difference is noticed as yield results and in plant health. Whether the hydro grow kit with LightRail light movers is active or passive, the important thing to know is this. The indoor growing kit setup matters. So, we want the larger, light-loving plants positioned under the indoor grow light of our hydroponic lighting setup. And, we want these plants paired with the active hydroponic system. Also, we want the smaller, lower light plants to be positioned slightly offset from the indoor grow light. These lower light plants can work well with a passive hydroponic indoor growing kit. And, this passive hydroponics can be as simple as an inverted bottle that self-levels. It’s the perfect way to maximize the grow lights for indoor plants depending on their hydroponic lighting needs. Yes, the indoor grow light shown in the video is fine for seedlings. But, a good quality grow light system on a grow light mover is what is needed for anything beyond that growth stage. A LightRail light mover for the hydroponic lighting will get the best results for our indoor grow systems. And, whether it’s a passive or active system that fits best for our hydro grow needs, the best indoor grow lights will always be moving on grow light movers.